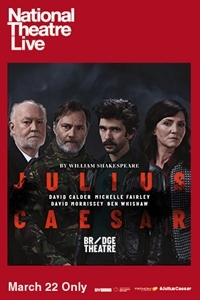 Fathom Events, BY Experience and National Theatre Live bring Nicholas Hytner's production of "Julius Caesar" from the stage to the big screen on Thursday, March 22, 2018 at 7:30 p.m. local time. The acclaimed production of "Julius Caesar" will thrust audiences into the street party that greets Caesar's triumphant return to Rome. Alarmed by the autocrat's popularity, the educated élite conspire to bring him down, but a rally assembles for his funeral and chaos explodes in its wake. This thrilling production includes David Calder (Caesar), Ben Whishaw (Brutus), Michelle Fairley (Cassius) and David Morrissey (Marc Antony).